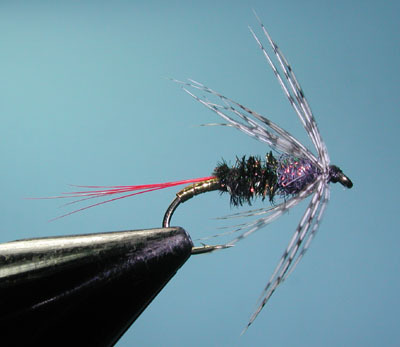 Notes: The Gray Hackle Peacock is a soft hackle wet fly that was one of the earliest flies tied. It originated sometime in the 1700's. The fly resembles emerging caddis pupa. Some patterns will withold a thorax section and will substitute the Partridge for Grizzly Hen Hackle. By using a partridge hackle, a dubbed thorax will assist in supporting the hackle in a upright position. 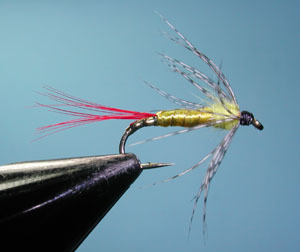 Partridge, having less web than the Grizzly Hen Hackle, will give the fly better movement within the current drift. Mainly fished on slow drifts in streams were the fly is swung up and across the stream and allowed to drift with the current. The rod tip should follow the fly's position. The fly will reach the end of the line and swing in an arc towards the side of the caster. Strikes will often occur during the beginning of the swing. Short, slow strips give the fly the appearance of an emerging insect. Strip up-current until it is recast. On faster water, the cast will have to be at a angle downstream. Constant mending will need to be used to slow the swing of the fly. Since the fly is being retrieved upstream, it is easy to pull the hook away from the trout's mouth. Try to keep the hook sharp and use a slip strike to set the hook. Bring the rod tip to the side rather than straight up when setting the hook.